is the Inception of the end of entertainment that comes in boxes? I’ve been sitting alongside an agency digital team recently and one of them piped up yesterday that they thought £5.99 was a bit steep for Warner Bros’ Inception iPhone app, even if it was ‘fully-loaded, connected viewing experience’. 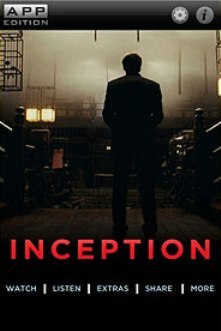 The guys were a bit concerned that with a film like Inception you’d miss all the special effects on a relatively tiny iPhone screen – but more importantly they couldn’t get their head around paying £5.99 for something they could only watch on a mobile device. I think their real issue was around the difference in perceived value we attach to stuff we download vs. tangible stuff that comes in boxes. We’ll pay 99p for singles on iTunes – but we used to shell out around three quid for a CD. Likewise, an album on iTunes is considered a bit steep if it costs more than a tenner, but I seem to remember that most albums on CD came in at rather more than that. It’s going to be really interesting watching as film rental and home viewing sales (a la Amazon and lovefilm) move properly to a download/streaming model – will we still be prepared to pay as much when we can’t hold the DVD in our hot little hands?